Just to the side of the main Patten Gymnasium entrance stands an inconspicuous door with a keypad lock, marked only by a small “Wildcats Golf” sticker. 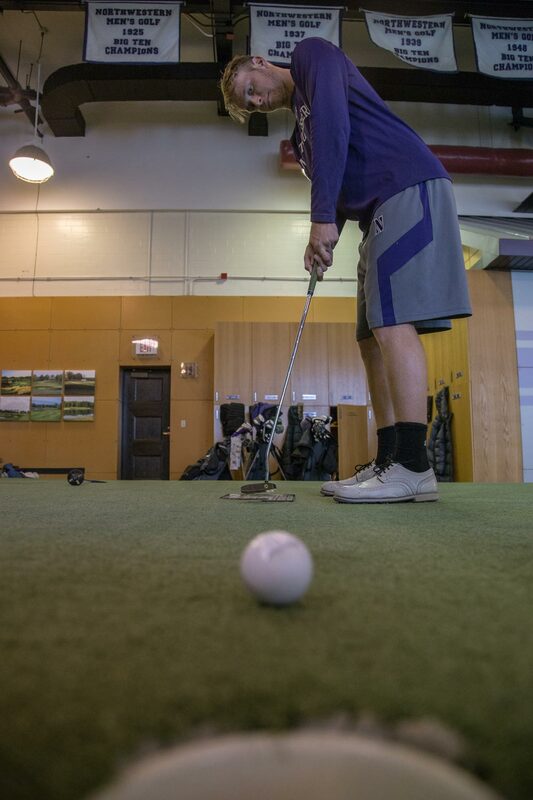 Inside is a hidden treasure in the world of Northwestern athletics: the Gleacher Golf Center. It gives the teams a rare recruiting advantage over warm weather schools, helping attract top recruits and allowing players to practice regardless of windchill. With the Gleacher Center, the team has an answer to that question. It’s a place where student-athletes can chip, putt and relax during brutal winter months, according to Goss. The facility includes a 2,400-square-foot green to practice both putting and chipping, a sand trap to practice bunker shots, a video room outfitted with specialized lighting, a locker area and a players’ lounge. 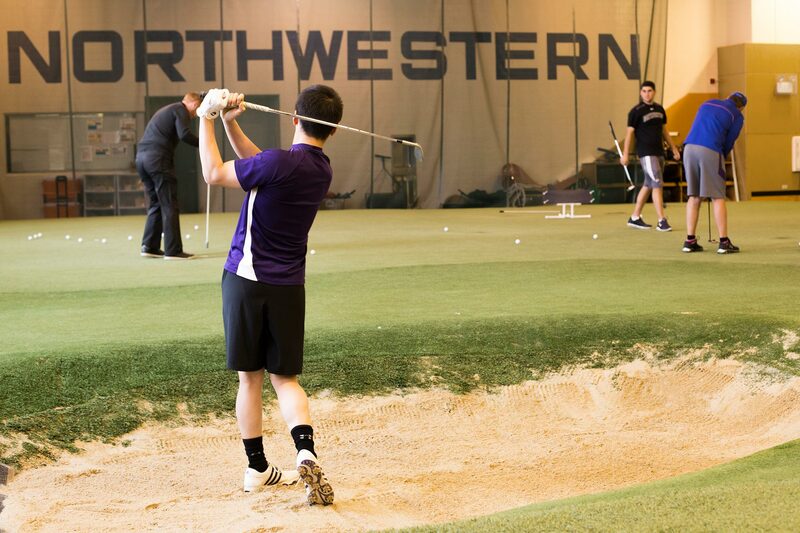 These features have helped the program attract top golfers to Northwestern, including multiple All-Americans, players who have gone on to the PGA or European tours after graduating and even 2013 U.S. Amateur champion Matt Fitzpatrick, who left after a quarter to focus on his professional career. The team’s most well-known alum, former world No. 1 Luke Donald, won the NCAA Division I Men’s Golf Championship months after the Gleacher Center opened in January 1999. “That was not coincidental,” Goss says. Goss began thinking about the construction of an indoor facility in the mid-1990s, but he couldn’t find a place to build something from the ground up. With the help of facility workers, he found the old pool area in Patten Gym, which was then being used for storage. With a go-ahead from university administration and a generous donation from golf team alum Eric Gleacher, the facility, which cost roughly $1 million, was built. 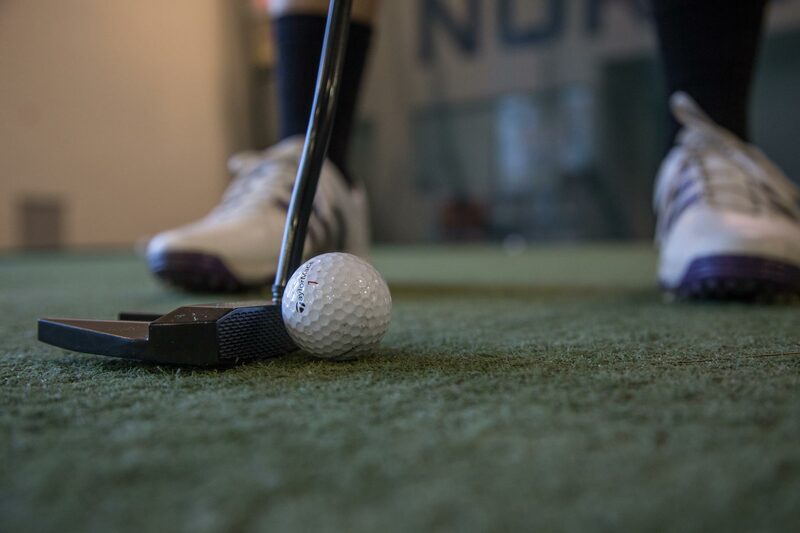 NU was the first school in the country to build a significant indoor golf facility, but after the Gleacher Center’s completion, many colleges have followed suit and built similar facilities. About 50 schools have toured the space before building their own practice centers, Goss says. “The formula we came up with here continues to work,” he says. Multiple players on the current roster hail from warm-weather states, choosing to come to Northwestern to help fine-tune skills during winter training. “It’s a good break to get away from just competition all the time and try to focus on what you need to work on and improve for down the road,” says Communication senior Matthew Negri. Inglis shares a similar view on the benefits of training indoors, focusing daily on fundamental skills instead of playing 18 holes during the off-season. Beyond advantages in recruiting warm-weather golfers and taking a step back from scoring to focus on improvement, the Gleacher Center also gives the golf teams an intangible benefit. “This gave the kids a home,” Goss says.